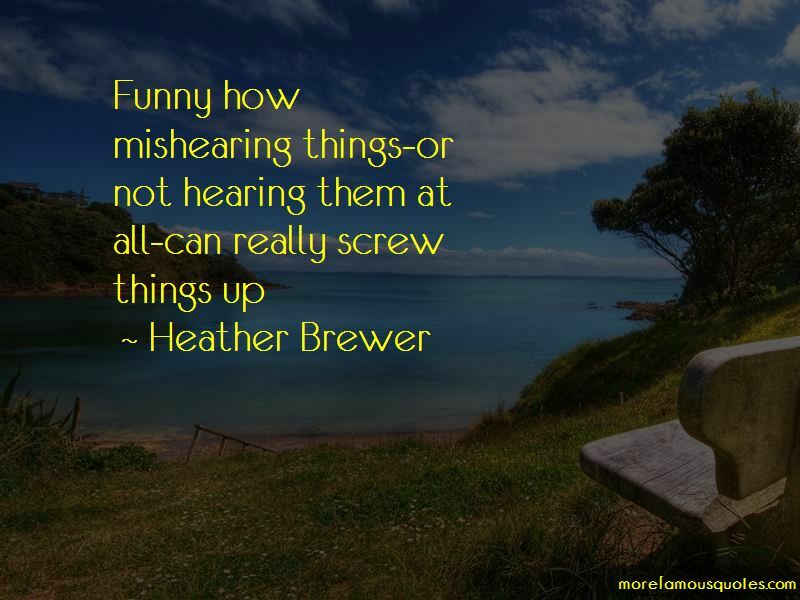 Enjoy the top 78 famous quotes, sayings and quotations by Heather Brewer. Vlad blinked at her. "Morning, sulfuric acid." What are we going to blow up?" Morgan sighed happily and slapped joss on the back. " Kid ... you just said my seven favorite words. According to his dad's journal, vampires had been through some of the worst epidemics in history. And apparently, during the days of the Black Plague, their biggest complaint had been rotten "food". A word of advice, if I may? Explosions are an excellent way to kill the undead. But you should probably take a few steps back first, kid. “Henry held up his taco- formerly Vlad's- and grinned. " Little known fact, gentlemen. Tacos are the food of genius." People says it gets easier. People are stupid. Let's go eat turkey before I beat the crap put of my cousin. The way he said it, Vlad wasn't sure if Henry wanted to eat instead of beating Joss to a pulp, or if he just didn't want to do it on an empty stomach. Some grown-ups could be so inherently stupid. Try banning homework sometime. You might see those straight A's so many parents long for. I swallowed hard. It was my life. And it was my choice how I decided to live it. "Well, if you can't answer those simple scientific queries, then what makes you think that mankind is smart enough to discover vampirekind's existence? The lapels of Sprat's many-buckled jacket were covered with buttons. Most of them belonged to bands, but a few were pretty funny. Like the one that read 'MY FAMILY'S A FREAKSHOW WITHOUT A TENT' and the one that boldly proclaimed 'I (HEART) BEING AWESOME'. Vlad pointed to the one that read 'I'M SO GOTH PEOPLE ASK ME TO AUTOGRAPH BOXES OF COUNT CHOCULA' and smirked. The truth is I like having this connection with you. I like that you can call on me for help without either of us realizing it. I like that we have each other's backs - whether it's reading the minds of random girls of fighting off ruthless vampires. I like that we're a team. And I'd be an idiot to give that up. Could you get O positive this time? That's my favorite. 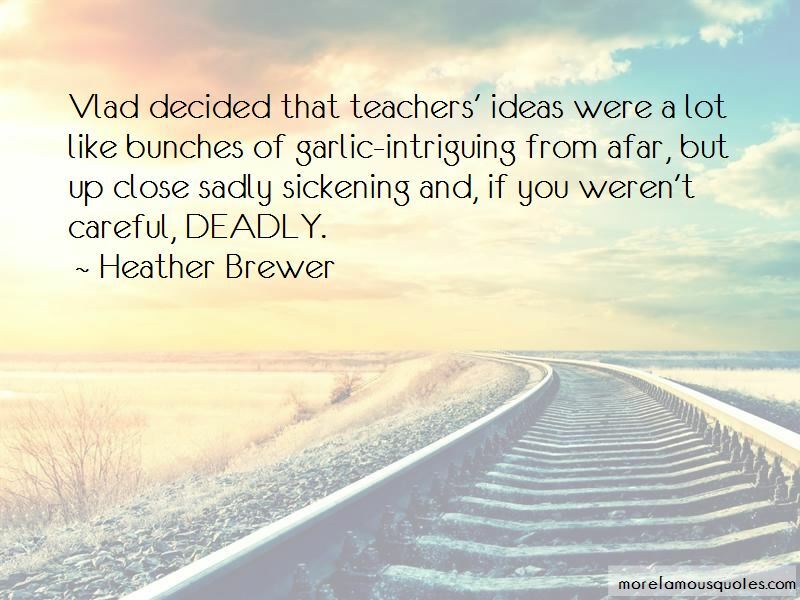 Want to see more pictures of Heather Brewer quotes? Click on image of Heather Brewer quotes to view full size.